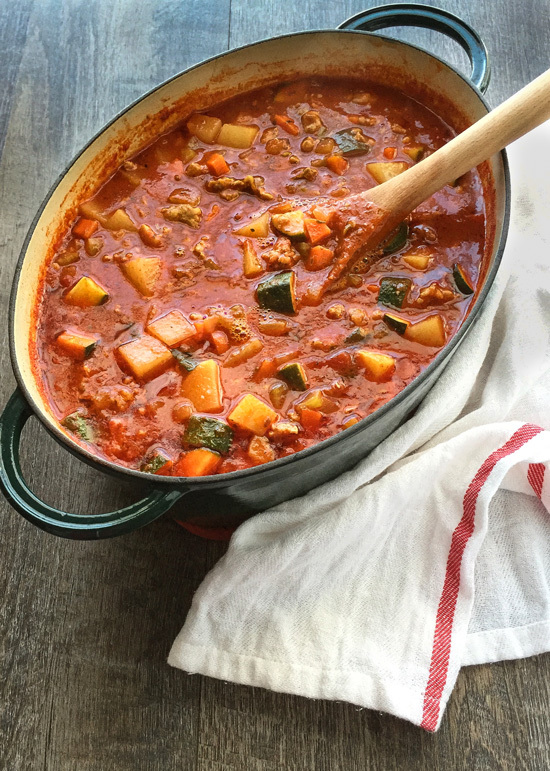 This Italian Sausage Soup with Potatoes and Zucchini comes together in a jiffy, but tastes like it took a whole lot longer. A good quality store-bought pasta sauce is the secret to getting this tasty dish on the table in no time. 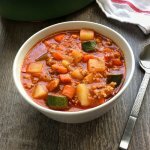 Today’s recipe is another super easy and quick soup that takes advantage of a jar of store-bought pasta sauce. 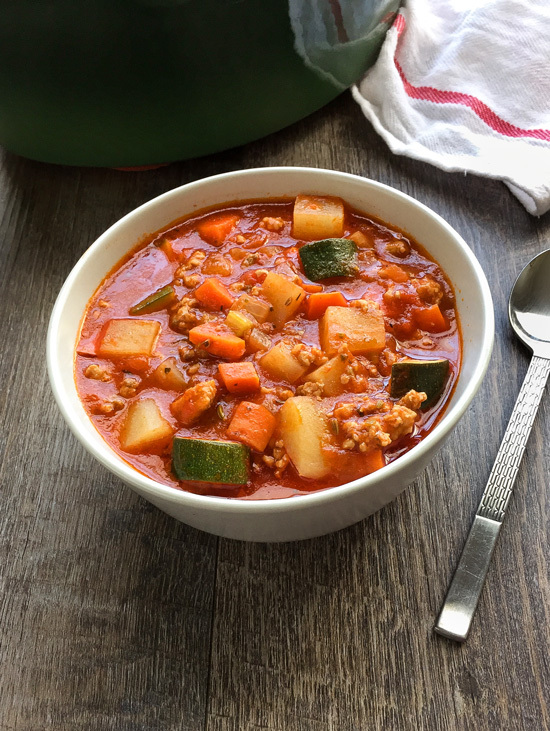 It’s amazing how this short cut can help get a tasty soup on the table without much fuss. It does require a bit of chopping because of all the veggies, but that’s the toughest part. Granted, when I first started learning how to cook, a thirty minute Rachael Ray recipe could take me an hour and a half. I was so slow at chopping veggies that it took me forever. Fortunately, after a lot of practice, I have gotten much faster at chopping. My meals come together a whole lot faster these days. For this recipe, I used a tomato basil pasta sauce from the Cadia brand. I was very impressed with their Roasted Garlic one, so I thought I’d try some of their other flavors out. This one was incredibly good as well. ORGANIC TOMATO PUREE, ORGANIC TOMATOES, SALT, ORGANIC ONIONS, ORGANIC CARROT JUICE, ORGANIC EXTRA VIRGIN OLIVE OIL, ORGANIC GARLIC POWDER, ORGANIC BASIL, ORGANIC GARLIC, ORGANIC BLACK PEPPER. Just for fun, I thought I’d share the ingredient list of a very well-known brand of pasta sauce. I did choose their organic one to be fair. ORGANIC TOMATO PUREE (WATER, ORGANIC TOMATO PASTE), ORGANIC SOYBEAN OIL, ORGANIC SUGAR, ORGANIC ONIONS, SEA SALT, ORGANIC GARLIC, CITRIC ACID, ORGANIC EXTRA VIRGIN OLIVE OIL, ORGANIC ROMANO CHEESE (ORGANIC CULTURED PART-SKIM MILK, SALT, ENZYMES), ORGANIC BASIL, ORGANIC BLACK PEPPER, ORGANIC FENNEL. Organic soybean oil and sugar. Um, no thank you. The well-known brand had twice as much sugar content as the one I used. It might add a little extra time to your grocery store trip, but reading labels is really important. You can’t just assume that the product is good because it has organic on the label. Of course, that’s probably what most manufacturers are banking on though. Obviously, making your own organic pasta sauce is probably best because you have total control over the ingredients. However, a good quality jarred sauce really can come in handy. That’s why I like to keep a jar or two in my pantry at all times. *I highly recommend that you buy whole fennel seed and crush it yourself. Fennel seeds start to lose some of their flavor after they have been ground. If you aren’t familiar with fennel seed, it has a mild licorice flavor. Here’s a great article that shows you three ways to crush whole fennel seeds. I added a dash of sea salt just before serving, but depending on the saltiness of the sausage you use or personal taste, you may not need to add any at all. The pictures have been updated on this recipe since it was first posted in 2014. 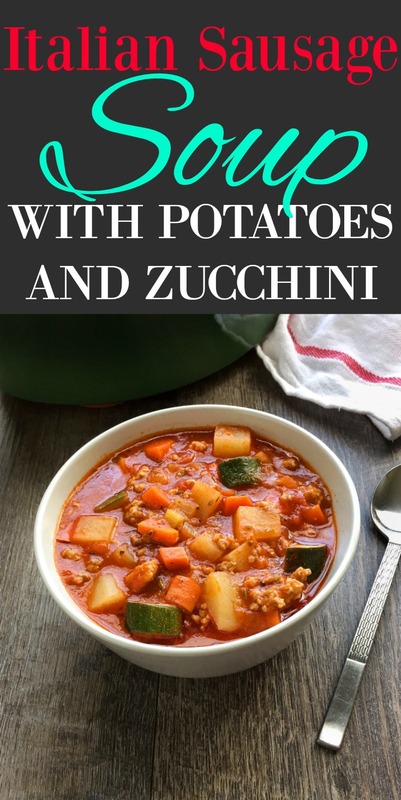 This Italian Sausage Potato and Zucchini Soup comes together in a jiffy, but tastes like it took a whole lot of effort. A good quality store-bought pasta sauce is the secret to getting this tasty dish on the table in no time. In a soup pot, heat the oil over medium-high heat. Add the sausage and cook, crumbling it with a spoon, until browned. Add the onions, celery and carrots and cook until soft, about 5-6 minutes. Add the crushed fennel and stir. Pour in the pasta sauce and water. Add the potatoes and zucchini and mix together. Bring to a simmer with a lid partially on and let cook until the vegetables are tender, about 20 minutes. If it's looking a little too thick for you during this time, you may want to add a little extra water. Check seasoning and adjust if necessary. If using sausage links, remove from casing prior to cooking. Posts contains affiliate links. If you purchase a product through an affiliate link, your costs will remain the same, but I earn a small commission. This helps to cover the costs of this site. I only post links to items that I personally use and recommend. Thanks for your support!